The Boeing 787 vs The Airbus A350 – What Plane Is Best? Edited: 24th October 2018 – Added in a section regarding maintenance and fuel efficiency. You can’t name a more competitive pair of companies than Boeing and Airbus, and they are forever trying to out do each other around the world. Boeing is currently schmoozing Korean Air with 777X’s whilst Airbus sneaks around china tempting Boeing clients. Both have flagship planes, and none is more published than the Boeing 787 Dreamliner and the Airbus A350. But which is the best? Let’s find out. Judging by the pure sale numbers of the two types (Boeing 787 at 1,398 orders and over 700 delivered / Airbus A350 at 890 orders and 203 deliveries), we can see that the industry prefers the Boeing 787. But as there are three variants of the 787 and only two of the A350, one has to take this as a grain of salt. Plus, the Boeing 787 started deliveries in 2011, three years before the Airbus A350. An older graphic above. 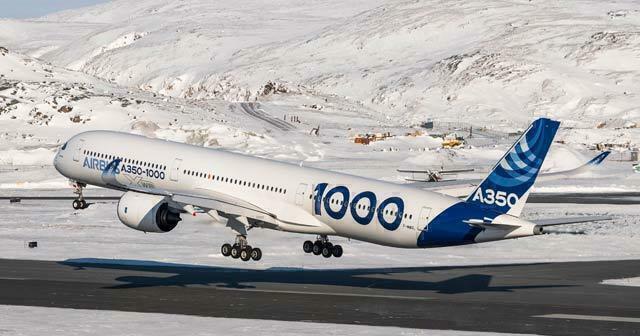 The A350-800 has been discontinued and buyers asked to upgrade to the larger capacity versions. So whilst Boeing has been first to market, has Airbus been able to improve on their original concept? How will we compare the planes? We will rank the two planes on several different factors in the chart below. We will think from the mindset of an airline, were business and profit is key. Whilst one of the planes might have a cool feature unless it makes an improvement financially, then it will be ignored. We will also be comparing the most modern versions, the 787-10 vs A350-1000. What is rather fun is that the Airbus being European will be measured in metric units, and Boeing being from the United States will be in imperial. Thus there is a lot of converting and we have tried to match up units as best as possible. Some critics might suggest its better to compare the Boeing 777X vs the Airbus A350-1000, but as the 777X does not fly yet it would not be a fair test. Let’s compare them head to head. Cabin Size: Thanks to the bigger size of the plane, the Airbus A350 has an extra 10cm on board for passengers to enjoy. Naturally, this is almost inconsequential so we will say Draw. Cargo Capacity: Despite the Airbus being bigger than the Boeing, they both have roughly the same cargo capacity. Draw. Related: See how your own miles would stack up against these aircraft with the Capital One Venture Rewards card’s offer of two miles per dollar spent, or a whopping ten miles per dollar on Hotels.com. Learn more about this card, or first see our SimpleFlying travel rewards cards comparison. What about maintenance and fuel efficiency? It is an open secret that the Boeing 787 is by far the most fuel efficient plane on the market. 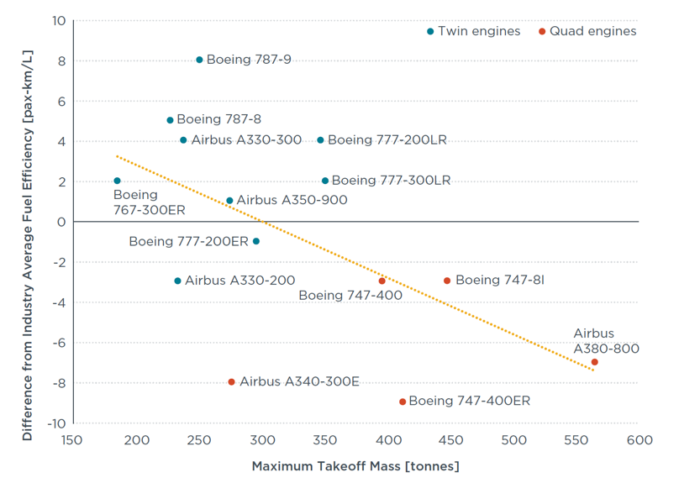 Below is a graph that ranks the fuel efficiency of each aircraft comparatively, however the fuel efficiency of the Boeing 787-10 and Airbus A350-1000 are not present (From 2016). Per seat, the Boeing 787-10 would come out ahead of the A350-1000, but as the A350 can carry more passengers, this may negate any savings made. Additionally, because of all the technology and new features, the Boeing 787 has been running into engine problems, having to be replaced by an Airbus A380, or an Airbus A340. Just from reading above you would realize that the Airbus A350 has the 787 beat in passenger numbers, range and fuel capacity, whilst the Boeing just gets there a little faster. However, this is one last area we have not compared, Price. As you can see, the Boeing 787 is cheaper. If you are an airline that is not flying over the max distance of the 787, between smaller destinations that do not have the capacity for a larger plane (Such as a Boeing 777) then all you care about is price and speed. And you bet Boeing will give you a great discount if you order more than one, beating out any possible discount Airbus could provide. Plus, with the savings brought by these two planes on fuel consumption, you are guaranteed to start earning more faster with the Boeing. A perfect example would be a US domestic carrier like United or Delta. So who is the real winner? Depends on what you need it for. Be sure to read our article, Boeing 787 vs Airbus A330neo. Edit: and our other article Boing 777x vs Airbus A350. The true clash of the Titans. Let us know who you think should win in the comments. Technology and competence remain to Boeing. Stop hiding behind your small finger. True, but do technology and competence mean more dollars for an airline? Or do they need trucks to just move passengers around? Nicholas, your Airbus bias is evident all over the website, and it was apparent right from the get go with this comparison. “Judging by the pure sale numbers……we can see that the industry prefers the Boeing 787. So we will just pretend that Airbus didn’t originally unveil 3 variants of the A350 with the 787-9 sized A350-800, but later cancelled it because it sold so poorly? Very true Bruce, I totally agree with you that there was a third version of the A350 which no one (well practically no one) ordered. I agree that is was a bit misleading and i’ll fix up the article so future readers don’t see any bias (which I don’t have, my favorite plane happens to be the C-100, followed closely by the 777X). what the article forgot to mention is cabin noise and comfort for passengers. Boeing aircrafts are noisy for passengers – I rather sit in a comfortable and quiet airbus on a longer flight. True that Airbus designed cabins that are whisper quiet from engine noise….too bad all internal noise by the passengers talking …babies crying clanking of silverware are easily heard. I’ll take the white noise in a Boieng cabin that drawns out all that noise to the so called whisper quiet Airbus cabin full of noise from passengers cacking and clacketing about to unbearable levels. Doesn’t the 787 have hgher humidity levels and higher pressurization than the a350? Increasing customer comfort. Airbus has been the leading technological company in commercial aviation, they pioneered FBW and advanced use of composites since the late 80’s, there are facts, perhaps you should be more intellectually honest and stop fanboying for Boing because well…’Murica? The main category you missed is the market fit. Boeing exceeds the A-350 by trumping efficiency over seat miles by every type. Yes The A350 does carry more fuel to go further with more passenger thus enhanced space is needed for more customers. Airlines are looking for a business fit using seat miles metrics. A passenger in a seat will go with less expensive per mile on a specific route. The A350 has a lot of unnecessary capability each trip it takes when it can’t fill the seat or have long-range routes available. The best airplane is the one that has the best capability for a customer’s market plan and Boeing exceeds Airbus at every corner of that market. Totally agree with you, hence the last paragraph of the article explains that its all about business fit. I believe that the 787 is the best fit for smaller domestic routes, but if you are going long-haul (like recent Singapore to New York route) then go A350. Shallow journalism. These are two different size aircraft, so apples and oranges. You also forgot 787 larger windows and non-bleed air pressurization. 787 also has high-tech turbulence avoidance system. The last two I mentioned makes for a much more comfortable long distance flight for passengers. Actually, it’s Airbus that can make the price deals, as A350 development was heavily subsidized by the European governments. It does seem like Boeing is ahead on the technology compared to Airbus, being the first to market for a variety of different improvements to Air travel. I certainly would prefer a more comfortable journey. However, I would hesitate to suggest that Airlines really care about passenger comfort, after all with them wanted to cram as many people on planes, reducing services and competing against low-cost carriers whether or not an Airline is comfortable is not high on their priority. True, we will have to see how the US government changes their trading policies when it comes to airlines, whether or not tariffs apply to Airbus planes. Agree. Misleading article. Not an apple to apple comparison. Should have compared the B787-10 vs the A350-900. The Airbus A350-1000 should be compared against the B777X. Hope that this article is updated in the future when more data from the B787-10 becomes available. Have you read our follow up article A350 vs 777x? 1. Maintenance costs and out of service time. 2. Availability, or lack of, due to faults, snags, etc. Very true, the Boeing 787 has been experiencing some problems lately (With the engines) and thus has had to have Airbus planes covering for them. If I have a choice it would be Airbus, second to none! 787 makes me feel claustrophobic, bigger windows yes, but you can’t look out, because some airlines dim the windows, even during daytime flight. Good article and interesting facts. I am impressed that Nicholas is trying to reply to comments, whether it’s pure criticism or praise. DT, your silly bias for the #2 planemaker is showing. You cannot really compare the A350 with the B787 family since both airplanes are based on completely different design objectives. The larger A350 was intended to go after the B777’s market dominance. In fact, the A350 family is sized more like todays B777 family, not the smaller 787. The A350-900 is a good airplane IF you are a premium carrier that can generate enough revenue to pay for its higher costs while the A350-1000 only allows an upgauge from the -900, but offers no advantage over the very popular B777-300ER and the future B777X Family. Very true, but as the 777X has not rolled out yet we can’t say for sure that the A350 is a good competitor. Be sure to check back in once the 777X launches and we can do a good (and fair) comparison. The A350 is kind of an in between model that tried with one model to compete with both the 787 and the 777. The 1000 definitely will give performance advantages over the older 777 models but at a higher price (look at the purchase by United of the 777-300ER). Recent sales definitely show that airlines think the 787 meets their needs better than the A350. I believe this is largely due to maintenance and performance issues on the majority of their routes, which are not out anywhere near maximum range. Notably at this moment, neither the 777 nor the A350 are showing high demand. As another mentioned, maintenance cost is huge, and while you noted total distance and had the fuel capacity, you did not come up with fuel efficiency numbers (range/fuel capacity) which definitely seems to come out to the advantage of the 787. For sure Don, Fuel efficiency is super relevant when understanding which plane is best. When looking at the range and fuel capacity, the Airbus is a clear winner, but the Boeing 787 is known for being the most efficient plane on the market and would actually use far less fuel on the same (Shorter) route. However… in a business case, we need to consider fuel efficiency as per passenger, rather than the whole plane. After all, the Boeing 787 would be carrying fewer passengers (if full) than the Airbus (if full) and thus would the Airbus negate any gains made by the Boeing reduced costs? Naturally, I haven’t done the numbers and I suspect that if we did compare using fuel data the Boeing 787 would be a winner and cheaper to run (and cheaper to buy as above) and hence why it is so attractive to buyers. You can clearly see how the Boeing 787-9 compares. Edited: To make the comment a bit clearer. Thank you Nicholas. The article you gave is great. The only factor missing, and which I do not think that any of us can add, is each company’s load factor. I would assume that as the size of the airplane increases, the % goes down, which makes the A380 look even worse than the article, and the 787 even better. For sure, the load factors and economics of an A380 don’t seem to make much sense these days, which is a shame as I love the giant planes. More fuel efficient smaller planes (That can have higher load factors) seems the way to go. The 787 is a technically superior plane to the A350 and was designed from the ground up to be one of the most fuel efficient and comfortable planes ever built. The A350 was a last minute design to both the lack of response to the A380 and as Europe’s answer to the superior 787. It was designed hastily amidst growing worries of the 787 dominance in this plane segment. There’s really no comparison. The A350 as some have correctly pointed out is actually a competitor to the 777. 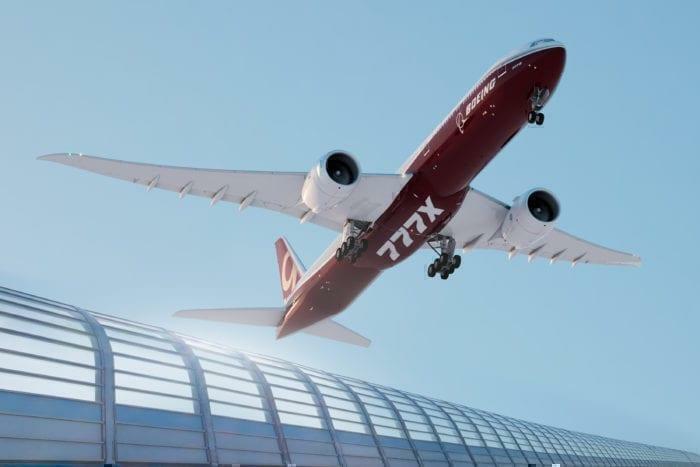 Once the 777x is completed the plane plane may have a hard time competing in any segment. Of course, only Boeing cheerleaders (i.e. mostly Americans) would claim that. Most technically astute observers, though, would agree that the 787 and A350 are about equally advanced. Now, as a matter of fact, it was the A350 that was designed using sound design principles and realistic development scheduling, while Boeing decided not to follow any of industrial best-practice recommendations on the 787 — suggesting that new products should use existing processes and tools, the existing organisation and/or demonstrated technologies. Only three years after launch, Boeing prematurely rolled out the the first 787 on 07/08/07 in an “empty-shell” Potemkin-type roll-out — leading to the biggest industrial disaster in Boeing’s history and $30 billion in deferred costs. When the deferred production costs are properly accounted for a decade hence, or so, Boeing will still be in the red on the 787 as the $15-20 billion in development costs will have to be recovered before Boeing can claim that they’ve reached the point of break-even on the 787. Your comment on deferred development costs needing to be recovered is widely quoted in blog postings and wrong. Costs are paid up front as incurred using the program accounting method allowed under US accounting procedures. While the loss is paid today, it is recorded but deferred into the future; the effect of which is to reduce future taxes. Program accounting allowed Boeing to post profits even when the 787 program was in the red and Boeing Commercial Aircraft was cash negative. Boeing will posts a loss on every aircraft for the entire run in order to reduce tax liability over the whole aircraft run. Now Boeing posts smaller profits now to compensate for paying dividends when they were cash negative. If you have been watching Boeing’s free cash flow for commercial aircraft over the past five years, you would notice that the there has been an very large increase in free cash flow while the 737 and 777 were R&D drains and both production lines were slowed down to retool for the new models. How? The 787 has been contributing to large profits for years now and the 787 is well past the break-even point. So, the fact that the A350’s fuselage is 10 cm wider can be ignored, but the fact that the B787’s max speed is 3 knots, only 3 knots higher is a plus?? Give me a break!!!! These planes never fly at their max speeds, their cruise is Mach 0,85, regardless of what cost index you put in. This comparison is simply stupid. Both planes are extremely advanced technologically, extremely efficient, and the factors that can make an airline choose one of them in detriment of the other are vast, this discussion is pointless. Joao thanks for the comment! I did have a bit of a laugh when I realized I did in fact put one airline over the other for 10cm and 3 knots respectively. I’ll leave it in there for now, but don’t worry we won’t let that slide in future comparisons. Because Airbus and Boeing are always trying to outdo one another, there is a very real possibility that their planes will have various different points of difference (However minor) that allows them to be compared. We are currently seeing three different Airlines trying to choose between the A350-1000 and the Boeing 777X (And you can check out that article here! ), each has advantages and disadvantages. I agree that each airline has a different purpose for their planes, and that’s why at the end we try to close off the argument with “Depends on what you need”. The technology and materials of a 787 are so good that boeing doesn’t want to use them on the new 797. Instead they will go back to traditional aluminium. Interesting article Nicholas thanks for sharing, I agree with your article. But “If it’s not a BOEING I’m not going” !!! Interesting article Nicholas thanks for sharing. I agree with your article. But “If it’s not a BOEING I’m not going” !!! Hi Richard! I’m Australian so I’d love to know what section you found biased! I guess raw stats can be compared all day long – but for me what ultimately counts is the experience in-cabin. I travel widely, short and long haul and for me I actively avoid Boeing products wherever possible, like for like I just find Airbus models to be quieter with more room. I would use KLM for trips, but avoid them if at all possible as I detest the cramped, antiquated layout on the 737 they use and it’s unbelievably poor air con. Sorry but the 737 is an ancient 60’s design long overdue replacement. You can add blue led lighting and winglets all you want, but as a pilot said to me ‘all it’s really doing is putting lipstick on a 50 year old lady’. The A320 (particularly the neo) is amazingly quiet and refined in comparison. And when the sun shines and you are held on the ramp for 45 minutes you know the air con will work ! Looking at sales/order data, anything larger than A320/B737, looks like B777 and B787 are really racking up the sales/orders away from A350, A380, B767, B747, etc (the larger than A320/B737 market). It appears that B747s are being replaced by B777, the A380 really failed to capture the B747 market, and even the new B747 doesn’t appear to have a strong start probably due to the B777. Any residual demand appears to be falling favourably to the B787. The early order data suggests that the B787 may eventually overtake the B777, like the B777 overtook the B747. Airbus may be miscalculating the market by producing larger aircraft to reduce seat-mile costs; when smaller aircraft are appearing to be more palpable. Maybe because of reduced risk in actually filling the planes, and the ability to offer more flights may be more lucrative revenue wise? Time will tell I guess. I am more realistic and wouldn’t rule out a brand entirely but I will say “i ain’t going if it’s a 787”. I loved the 787 when it was introduced but after many rides on it, I chose to stop because it’s simply one of the worst in-cabin experience you can find… All the stuff Boeing cheapened 787, leading to an airplane of 2-3 years old, rattles and shades more frequently than a 20+ year old 767. Both aircraft are at the top end of passenger comfort and experience, only the A380 offers a better cabin on the metrics in all classes. In business the emirates bar at the back of the A380 is a benefit I really enjoy, not for getting drunk standing up, just standing up and moving to break up a long haul flight, it’s a real passenger benefit for the business and first class cabin. I have flown all in economy and business. As a passenger I find the extra inch of width on my economy seat makes a BIG difference and I am an average 1.8m and 78kgs. Yes one inch makes a difference especially at shoulder height. The quieter cabin is marginally better than the Boeing but not as big an impact as the extra inch. We are talking long haul here. Both are excellent aircraft and history will likely point to the step change in passenger comfort as occurring at the entrance to the market of these two aircraft. The cabin pressure and humidity is a significant improvement and both aircraft seem equal in this respect. This makes a huge difference in arriving hydrated and with good wellbeing. Clearly there is a calculation for airlines in the economics of each aircraft. I don’t really care about that as a passenger subjecting myself to a 8 to 14 hour flight I just want comfort and to walk off feeling as good as I can. I would fly the A350 in economy for the extra inch and marginally quieter cabin. In business class I would be nearly indifferent but take the better departure time as the differentiator if price and service were equal. Anybody looking for an A320 cockpit Shell 90% complete? I can’t sleep on the big Boeings. Horrible vibrations. I value sleep so i prefer Dreamliner or way aft and down in the tail in an A-380. I rarely fly domestic so we take off north from SFO then right for EU or left for Asia. Got here to Asia on A-350-900 and will return from Singapore on a Singapore Girl A-350 (1000?). I have maintained and managed both Airbus and Boeing products since 1977. Boeing builds a better and longer lasting aircraft than Airbus. Right from the start I can see a lot of bias, fueled up by American nationalist pride. However, as a global traveller given the fact I’ve had the chance to fly both airliners, I can firmly confirm A350 is the better aircraft, at least from a passenger point of view; and let’s be honest here, you mentioned speed as an important variable, but I find it ridiculous since the difference is only Mach 0.01 and airliners rarely fly at Max speed. Every pilot I’ve asked so far, and some of them are big Boeing fan boys, they would rather fly the A350, and most would say that at this moment it is the most advanced airliner.